We didn't end up buying anything other than Ice Cream but it was nice to get out for a beautiful day and see a wonderful community gather to support one another and enjoy some live music. Tonight I am headed downtown for a concert with a friend. I'm really looking forward to a night out. The girls and I did some planning for their new room this weekend as well. Before we moved I had the girls pick their paint colour and they went with a pale aqua colour. I asked them to give me 1 idea each for their new room, something they really wanted to have in their special space. Emma said she wanted pictures of her favourite singers - Katy Perry and Sabrina Carpenter. Audrey said she wanted Christmas Lights in her room. There shared room is really tiny and we have just enough room to fit their bunk beds and a dresser so it's important we keep their room simple. Emma asked if she could have a mirror in her room so I think a small round mirror will be perfect. I'm planning to put a shelf underneath the mirror so she can put her brush and some lipgloss etc. on it. Target had these adorable knit poufs a while back and I'm hoping I can find the same thing when it comes time to complete their room. It would be perfect to sit on to read and can tuck away in their closet when not in use. 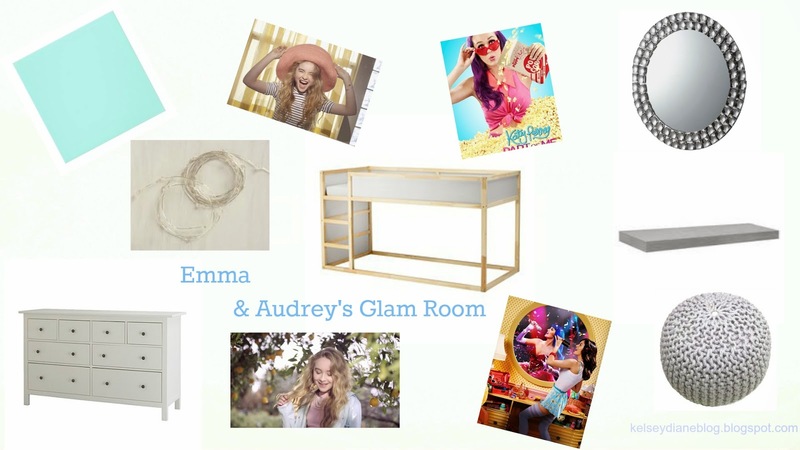 The girls and I sat together and made up a little Glam Room inspiration board.